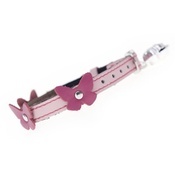 If you want your pet to look the bees knees, this Blue Bumblebees Cat Collar is just the ticket. Stylish yet practical, the bright colour helps your pet be seen and ensures they will stand out from the crowd wherever you take them. 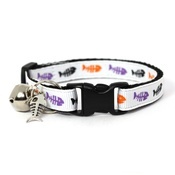 Keep your four-legged friend ahead of the fashion buzz while also investing in a hard-wearing and durable product; a top quality breakaway buckle and a split ring with removable bell are also included. 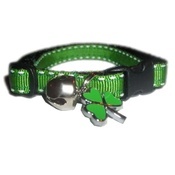 What’s more, the collar is washable, so it’s easy to make sure your kitty is seen wearing the right gear at all times. 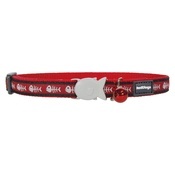 Bumblebees Cat Collar – Blue. Design stitched onto 1cm wide nylon webbing. Features a breakaway buckle and split ring. 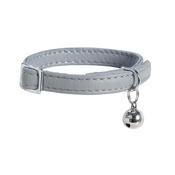 Includes a removable jingle bell and silver colour metal bee charm. Please check your items on delivery. If you wish to return an item, it should be returned to our partner seller directly and not to PetsPyjamas. If you wish to organize a return, exchange or refund of any item, please contact the partner seller concerned through the “My Orders” link in your PetsPyjamas customer account. For standard items, you have 7 days, from receipt of goods, to notify our partner and you must return goods at your own cost within 14 days of receiving the item. You must return items unused, in a saleable condition and in the original packaging that you received them with (with any labels still attached). You should use a ‘signed for’ delivery method and obtain proof of postage. Please note any exemptions and exceptions to the standard returns procedure, where the following items are likely to be non-returnable and non-refundable: personalized\customized items, perishable products (such as food), grooming products, large items of furniture which are often custom made and custom homewares. Please make sure you understand the relevant partner sellers' returns policies whenever you buy.